I was in prison and you visited me – Jesus. 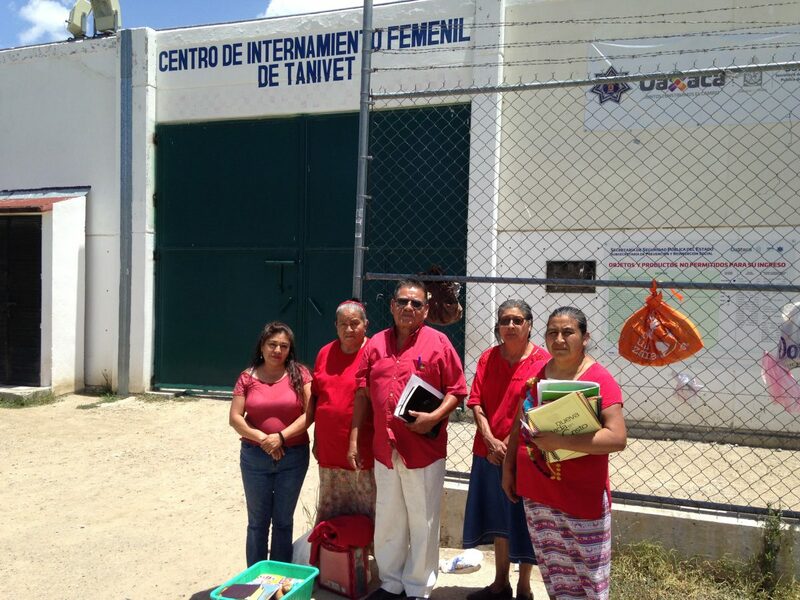 Yesterday, I visited the women’s prison Tanivet, about 20 miles outside of Oaxaca City, with three women from the Covenant women’s group here as well as Pastor Enrique and his wife. The women have been discipling a group of 10 inmates, of which about half are new believers. They had just finished “New Life in Christ” discipleship course and invited me to share God’s Word and celebrate the Lord’s Supper with the women. Elizabeth is the reason several of us from the Covenant women’s group have been visiting the prison. She was invited by Pastor Enrique and his wife, who have been visiting the prison for over 10 years now. God has given Elizabeth a heart of compassion for the women there as she often shares their stories and prayer requests with our women’s group. Last year, she convinced four others from our group to visit the prison and facilitate Mending the Soul, a Biblically based resource that seeks to bring healing from abuse. When I attended their closing celebration last fall (read more here), I was deeply moved by the women’s stories, how God has been at work in their lives while in prison, and their longing, desire and hope that God would bring them freedom one day soon. Yesterday, Pastor Enrique invited the women who participated in the discipleship course to share a testimony and one woman got up and said, “I’ve never stood before a group to share my story before but I feel like God was tugging on my heart to do so today”. She admitted that she didn’t know if she was innocent or guilty because she was too drunk on the night of the crime to know if she had actually committed the murder she was accused of, however, she also shared how she was raped by officers and forced to plead guilty to the crime. As she shared her story, she broke down often, and soon there wasn’t a dry eye in the room. When she was done sharing, Pastor Enrique called us all up to pray with her and she was held in an embrace as we all lifted up her pain, her story and her desire for redemption and justice to God. It was a sacred moment. When she sat down, I thanked her for sharing her story and told her she was brave for sharing it. She admitted that she had only shared a small portion of her pain because she couldn’t bring herself to talk about the suffering in her childhood. Again, she began to cry and I held her and cried with her once again. As I hear stories first-hand and learn more about corruption and injustice in the judicial and prison systems in Mexico (but also in the US – I am currently reading Just Mercy by Bryan Stevenson, who shares stories of how racism and other factors lead to unjust convictions that too quickly condemn people to death row, including some who are innocent), my heart breaks over and over for the pain and injustice that brought many of them to this place of imprisonment. Add to that the additional trauma and abuse they often experience while in prison is overwhelming. And so, I struggle with Jesus’s words “I was in prison and you visited me”. Jesus was innocent and non-violent. He shouldn’t be in prison, just like many of these women I just visited! It’s not right, the world is not right. But there Jesus is, close to the brokenhearted and those who are suffering. So, I shouldn’t be surprised that each time I visit I experience Jesus’s presence among the small group of disciples within the prison, choosing hope instead of despair, love instead of fear, compassion instead of hatred, forgiveness instead of bitterness and revenge. And, I realize Jesus wants me to visit Him, to learn from Him there in prison, to allow my heart to be broken over the injustices in the world, to be moved to compassion and action, to work together with my sisters in prison and Elizabeth and Pastor Enrique and those called to fight injustice like Bryan Stevenson to see God’s Kingdom come and His will be done. Love is a verb in your account. Thanks for sharing.